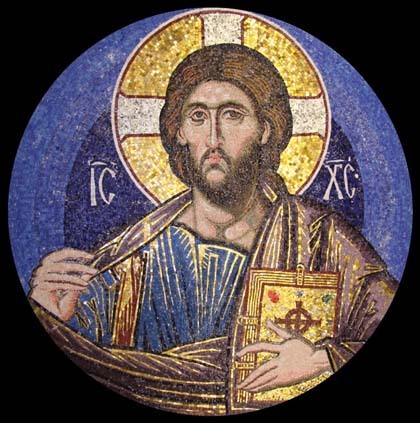 On his computer screen he eventually finds a mosaic image of Christ Pantocrator that draws his attention. It was recently completed by a mosaicist 7,500 km (4,700 miles) away, in the countryside of Shropshire, UK. 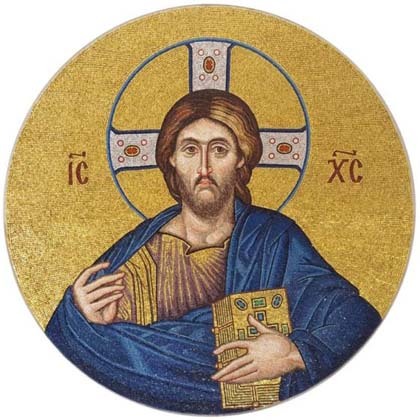 The mosaic has the spirit that he is looking for, so he decides he wants this person to make his church’s mosaics. So he emails its maker. 1. Mosaics reflect light, so the tesserae, especially gold tesserae, must be set at angles that maximise the effect. For this reason the reverse technique where the surface is left completely flat is fine for floors and tables, but disaster for wall mosaics. 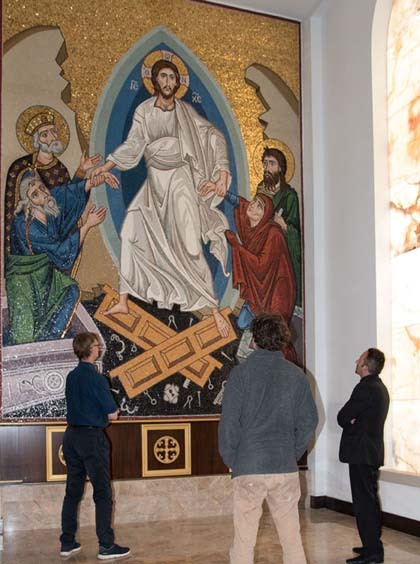 The top of the Houston mosaics were to be 6.5 metres high, so we set a lot of the gold tesserae to slant downward by up to 30 degrees off the vertical. We also laid the coloured smalti at odd angles so they would play with the light. 2. The rhythm of each line of tesserae is critical. These lines are called andamenta in Italian (line, movement, walk). Even if all the tesserae were white, good andamenta will clearly reveal the subject. They are the mosaic’s equivalent of brush strokes, creating form in themselves apart from any colour modelling. 3. It is no good trying to imitate a painting. Each medium has its strengths and limitations. A good artist will use the limitations of his or her medium to good effect, and not compel it to do something against its nature. The best mosaics therefore say a lot with little, leaving out secondary detail and making a feature of its pixilation. Where a painter uses glazes, a mosaicist must instead contrast neighbouring colours. 4. While not being garish in colour choice, for dramatic effect medieval mosaicists tended to use strong colours in selected places. Often, for example, one finds an andamenta of bright reds running down the side of a nose. 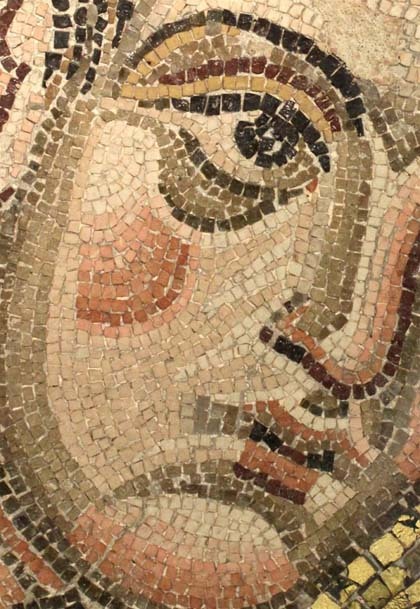 This overstatement helps compensate for the big distances from which mosaics are usually viewed. Also, because so much light is reflected from a mosaic the eye’s iris contracts to admit less light to the retina. The mosaicist therefore needs to amplify critical lines to make them noticed. 5. Less is more. 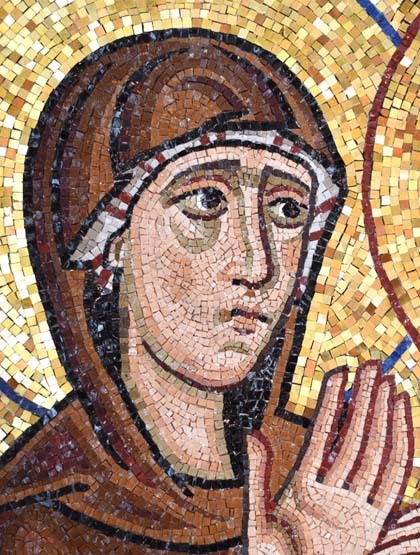 Due to technical limitations in manufacture, medieval mosaicists had a limited palette of smalti hues to work from. 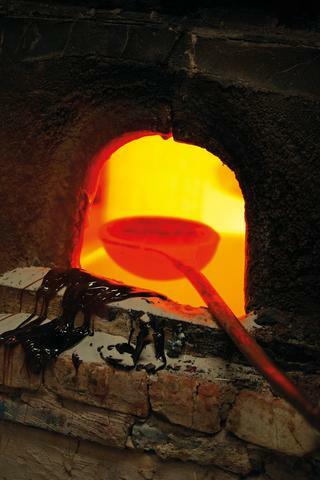 There was for example only one red smalti commonly available – an imperial red made from iron oxide. Stones had to be used for other reds. This technical limitation had the fortunate effect of helping mosaicists to keep chromatic unity. Today with new oxides available we are spoilt for choice, so one has to be particularly vigilant and self controlled when choosing a colour range. 6. There exists a perfect imperfection and an imperfect perfection. If one compares individual tesserae from medieval works with most of those produced today, one notices that the medieval smalti are less perfect. 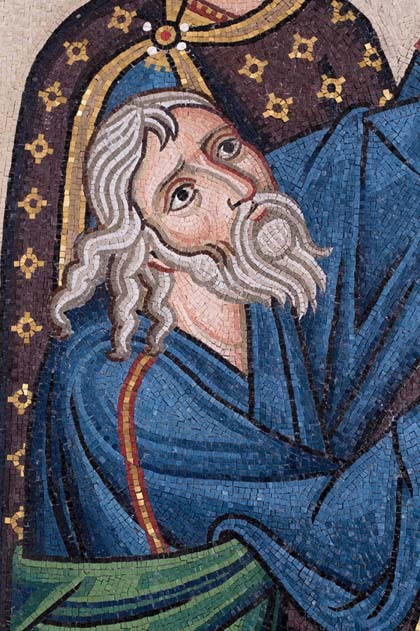 Each blue tessera from Ravenna, for example, might have three or more shades of blue. Being stirred by hand, the oxides were not been perfectly mixed. The mechanical mixers of today, however, do too good a job and the result is usually an even colour mix. So Martin and I, as much as possible, chose a supplier and individual colours that retained some of the imperfections so natural to medieval smalti. 8. Don’t be afraid to delegate, but keep control of quality. Although we cut most tesserae ourselves, to save time with these large mosaics we ask our gold supplier, Donna Murano, to cut most of the background gold for us. Because the Murano cutters’ perception of a good cut is to be as close as possible to a perfect 10mm square, we have to give quite specific instructions how to cut them irregularly, contradictory as this seems! We want edge lengths to range between 7 and 13 mm, and send a sketch suggesting how this could be done without wasting any of the gold pizzas. It is ironic, but these days it requires effort and conscious choice to obtain the perfect imperfection that was so natural to past masters. 9. Economy of cut. It ends up taking two of us about a year and a half to complete the mosaic, with help from various assistants now and then. 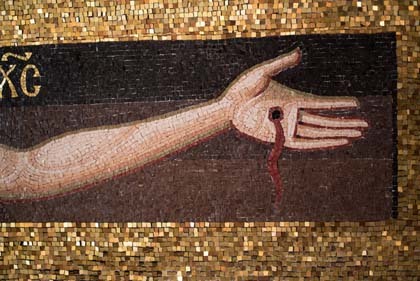 We estimate around 500,000 tesserae were hand cut to make the two works. 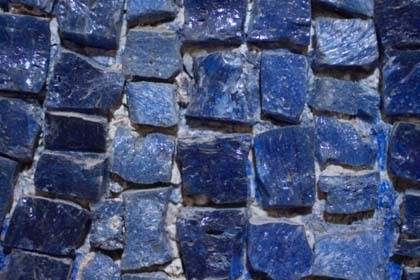 Most tesserae came in the “standard” cut of approximately 10 x 17mm, so each piece needed to be cut at least once. Making one unnecessary cut might take only five seconds, but multiply this by half a million and you get the picture – 560 wasted hours to be precise. But more importantly, fussy, over accurate cutting gives mosaic a mechanical feel. A common solution was to design the mosaic for economy of line in the first place. Although there are masterpieces, such as the famous gallery deisis at Agia Sophia, that are very detailed and painterly, most medieval works are created with economy of line, with andamenta of fairly even width and not many triangles. So we design our elements, such as hair, with this in mind. 10. Keep triangular tesserae to a minimum, preserving them for essential areas. Triangles tend to attract attention, so they are best reserved for special treatments. My teacher, Luciana, repeatedly stressed this. 11. Respect the particularity of each individual tessera within andamenta, so that they dance together and not march like soldiers in regimented single file. In other words, don’t try to cut each tessera perfectly or place them exactly the same distance apart. 12. Feel free to include surprising colours, especially in the garments. This creates vibrancy and depth. For example, we sometimes include blue shadows in red garments. 13. Use smaller tesserae for flesh parts than for garments and backgrounds. Our flesh tesserae measure around 7 x 7mm (0.3 x 0.3 inches) compared to an average of 10 x 10mm (0.4 x 0.4 inches) for the rest. This gives scope for more detailed and subtle expression, and also causes the viewer to focus more on the face and hands. Even “naturalistic” painters like Rembrandt often used the same technique. Compared to the face they left outlying details like garments and backgrounds much less worked, and even smudgy. 14. Choose an average size of tesserae appropriate to the distance that the mosaic will be viewed. Concurrently with the Houston works we made three other mosaics for a very small chapel. Because these were to be viewed close up we cut the tesserae much smaller, to an average of 5 x 5 mm (0.2 x 0.2 inches) for the backgrounds and garments, and a tiny 3 x 3 mm (0.12 x 0.12 inches) mm for the flesh areas. 15. Cut tesserae to generally the same size (though not identical) in each area, to give unity. Andamenta of haphazard width are distracting. These are an imperfect imperfection! 16. Avoid trying to make slavish copies of paintings. If painted icons are to be used as a basis, they need to be adapted to the new medium. Mosaic is cruder than paint, so one needs to go for the bold statement, and distinguish the essential from the secondary. In particular, garment highlight shapes are usually much less in number in mosaics than in icons, and mosaics generally favour smooth curves over sharp changes of direction. 17. Depend primarily on the power of the darker lines for expression, particularly for faces, hands and feet. These lines are what are first noticed at a distance. If they are weakly drawn, the most subtle modelling in the world will not save the mosaic from mediocrity. 18. Before beginning to place the tesserae the mosaicist needs to have a very clear idea of his or her design. Every detail of proportion and expression should be triple checked before committing to mosaic. Mosaic is time consuming to change, as I was to learn! 1. We spread lime putty about 25mm (one inch) thick onto an Aerolam panel. Kept moist and covered with plastic overnight, this lime has a workable time of up to three weeks, which gives us plenty of time to adjust the tesserae as we progress. This is particularly important in a face where every tessera contributes to the expression. 2. We transfer our drawing onto the lime putty using glassine paper and a water soluble felt tip pen. We often trace the essential andamenta as well as the main features of the face or garment. 3. When all the tesserae for a panel are in place we then need to affix them permanently to the panel. Although lime is the traditional fixing mortar for mosaics, our panels will be moved around and therefore lime is unsuitable as a mortar due to its brittleness. We need to reattach the mosaic to the panel using the much stronger and flexible Adesilex. To do this we first glue a thin gauze to the surface of the mosaic using pearl glue, which is derived from animal tissue. This is water soluble and strong. 4. After two or more days the glue is completely set. We hold our breath and lift the whole mosaic away from the Aerolam panel, every tessera hopefully still attached to the gauze. Using a pressure washer we then wash away any remaining lime putty from the panel and from the back of the tesserae, to reveal the reverse side of the mosaic. We purposely leave a little lime between the tesserae to help prevent the Adesilex from squeezing through to the front surface during the next stage. 5. There is evidence that Byzantine and Medieval mosaicists frescoed the basic forms and colours onto the lime plaster before setting in their tesserae. As well as providing the design, this fresco substrate had the added benefit of colouring any mortar that remained visible between the tesserae. We recreate this effect we tint the mortar suitably for each area – red for gold, blue for blue smalti and so on, and apply it the reverse side of the mosaic. A layer of plain mortar is also plastered onto the panel. 6. Working quickly before the mortar begins to stiffen and set, the mosaic is applied to the panel. We carefully press it down to ensure every tessera is attached, but not so hard that mortar is pressed right through to the front. 7. 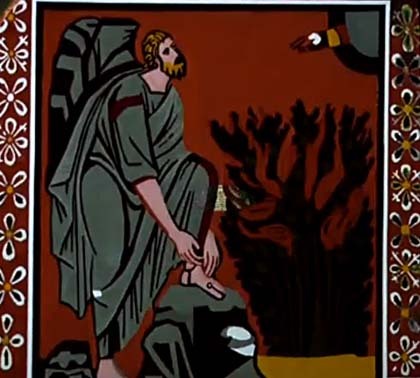 We wait a couple of weeks to allow the mortar to set completely, then remove the gauze from the surface of the mosaic by pouring on hot water, which softens the pearl glue. We then scrub clean the surface. We fix the panels using stainless steel screws and washers, screwed into large plastic rawlplugs in the concrete block wall. In the studio we deliberately left the areas around the edges free of tesserae, so now that all the panels are in place we can fill over the joins and make them invisible. The work in Houston is very much a communal effort. Father James and his wonderful family give us splendid hospitality in their home; the parish provides great lunches to keep us going; we have the help of various budding mosaicists, including 14 year old Ada Germany from Philadelphia and Baker Galloway from Austin, Texas; Octavia the secretary keeps things flowing smoothly, and even puts on an English high tea for us Brits; Alvera the handyman buys whatever extra tools or materials we need … the list goes on.